As a second-year student in the Masters of Public Financial Management program, I have continued to be exposed to instruction, strategies, and experts that directly and positively impact my day-to-day professional life. The content has consistently shown to be directly applicable and easily relatable to my job responsibilities. The experience and knowledge I have acquired from this program, the interactions with its faculty, and the discussions with fellow students have dramatically increased the fulfillment I find in my work. In addition, the program has helped prepare me for multiple promotions and, ultimately, the opportunity I have been seeking (and recently offered!) to serve as Chief Financial Officer for a local government agency. I cannot recommend this program highly enough!" The Master of Public Financial Management is designed to meet the current and expanding national demand for well-trained financial managers for public and non-profit organizations. Public institutions are faced with multiple challenges as they attempt to efficiently and effectively manage their finances and initiate new programs that are financially sustainable. The Martin School is among the top graduate programs in the nation in public financial management, and is one of very few offering an online MPFM degree program. Like the PFM Graduate Certificate, the MPFM consists exclusively of online coursework, which will engage students weekly through assignments, readings, exams, and other activities with the same level of rigor of other traditional Master programs offered by the Martin School of Public Policy and Administration. 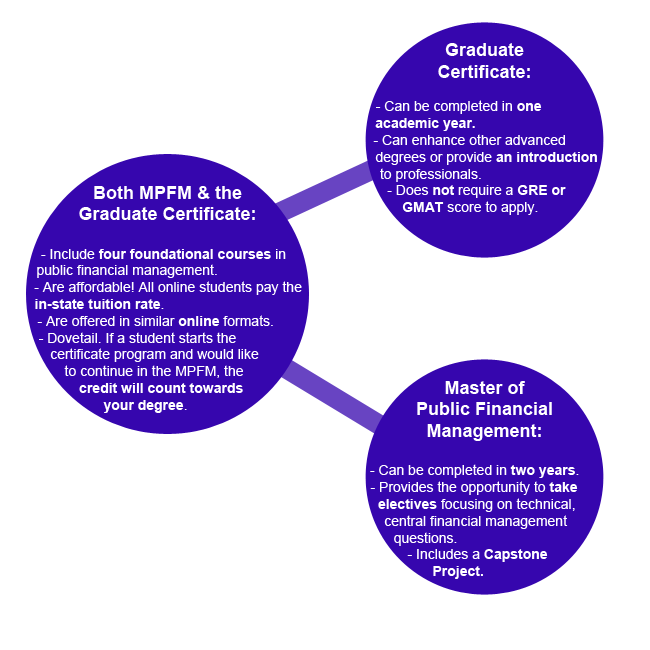 Where the MPFM differs from the Graduate Certificate, however, is in its depth. This 36-credit hour degree program includes all of the courses found in the Graduate Certificate, plus an additional 24 credit hours focused on technical, central financial management questions. The MPFM program will prepare students for advanced-careers in public financial management and analysis. The MPP program prepares students for a policy analyst or research career; the MPA prepares students for public management and administration positions. The MPFM will offer advanced topics in public accounting, audit, municipal securities, public pensions/insurance, and other special topics in public finance, topics not included in the MPA or MPP programs. The MPFM program will be offered completely online, allowing for non-traditional students and the flexibility of online coursework.Our MPA and MPP programs do not offer online classes; however, the majority of our MPA and MPP courses are in the evenings to accomodate working professionals living in the area. Like the Graduate Certificate program, all MPFM students will pay the in-state tuition rate, which is assessed per credit hour, in addition to semesterly fees. For the current tuition rate, visit the Registrar's website. For admission, students must meet all requirements of the University of Kentucky Graduate School, including a baccalureate degree from an accredited university. To be considered, potential MPFM students must submit a GRE/GMAT score, a biographical sketch, all academic transcripts, and three letters of recommendation through the Graduate School's online portal. For more information about applying, click here. Given the nature of the program, applicants are strongly encouraged to have some experience or education in accounting, however it is not a formal prerequisite. The requirement to submit GRE or GMAT scores may be waived for students who are enrolled in the Graduate Certificate Program in Public Financial Management and have successfully completed 9 or more credit hours toward the ceritificate. The Director of Graduate Students shall make the recommendation for the waiver upon review of the student's performance in the Certificate Program. The program can be completed in two years, including coursework throughout the summer between years one and two. Students take one 3-credit hour course at a time in 8-week sessions, with the exception of the first summer session, which is 4 weeks long. The culmination of the program is the Capstone Project, which is a self-selected research project centered on relevant policy questions. It is important to note that the first year is identical to the Graduate Certificate program. If a student starts out in certificate track and would like to switch over to the Master's degree program, it is possible for the student to count those credit hours towards that degree. However, the application requirements differ between the Graduate Certificate and the MPFM; the interested student would have to meet those requirements; this would require the student to apply to and be accepted by the MPFM program in order to pursue that degree option. Given the nature of the online format, this program requires self-motivation and time management from the student. Please be aware that admission and/or enrollment in this program cannot lead to the issuance of an F-1 or J-1 student visa. The University of Kentucky cannot sponsor a student visa or issue an I-20/DS-2019 to students in an online program. Per state laws, distance education courses and programs must be legally authorized in a state prior to offering courses or programs to students residing there. Therefore, program availability varies by state. Students should check UK Online to determine if a distance education program at the University of Kentucky is available in their state of residence. Important note for relocating during the course of a program: All distance education students should keep in mind that relocating during the course of a program to another state could impact whether that student can continue in the course and/or meet the eligibility requirements of that state.